1/7/02 - More work on the side bars and side armour. Dissasembled Tornado after INSPIRE. Bryan worked on annealing, and drilling out the new kart clutches. After the failure in Series 5, we are taking no chances, they will be brand new in Series 6! 2/7/02 - Went and got the spikes from Cambmac - they look excellent! Fired up the hardening furnace in the evening, but there's still some work to do to get it hot enough. Welded up the motors, and welded nuts on the chassis and side bars. 3/7/02 - Cleaned the old paint from the chassis, and started work on annealing it. Worked on the gears and kart clutches - drilled the first replacement and fitted it to the interediate gear. Finished work on all the motors. 4/7/02 - Beefed up the hardening furnace using the big fan and piping from my old gas warm air central heating system (don't try this at home kids!) - these made it much better! The thing sounds like a jet engine when running, and gets a 2"x1" dia. bar of steel red hot in about 2 minutes. Hardened all the spikes and disc teeth. Finished drilling and assembling the second clutch and intermediate gear. Continued annealing the chassis. 5/7/02 - Busy day - expected the bead sealer to turn up at work today, but despite staying on in the afternoon it did not - we'd been let down by a supplier again, and some rather paniced visiting of the local motor factors saw us being donated some Bead Sealer - many thanks to Ians Tyres of Huntingdon, you guys got us out of a bit of a hole there! Spent the evening working on various things - finishing annealing and cleaning the chassis, sorting out the last bits and pieces on the motors, drilling wheel spacers and starting to assemble wheels. Tidied the garage at the end of the night - it's going to be a busy weekend! 6/7/02 - Lots of work done today! Cut a lot of the armour, painted the chassis, side bars and side armour, made up the wheels, hardened the Fixed Spike, filed down the bolts on the intermediate gears, made new battery packing, and fitted the motor speed sensor to the ACW. Bryan finished the discs and wheel shafts. 7/7/02 - Another busy day. Cut much of the remaining armour, and started to assemble the chassis. But big problem - the chains were very slack indeed, and we had to reposition the roller - cut it out and weld it in again, on our nicely painted chassis! Oh well, at least it was fixable... Assembled and tested the ACW in the evening - we are very impressed, it absolutely demolished a microwave with ease! Started work on the final assembly of the ASW towards the end of the evening. 8/7/02 - First day of the Series 6 filming, and make or break day for our preparations! It didn't help that today was also a workday, but at least Andrew was able to take half the day off to get some of the remaining jobs done. Andrew managed to get the ASW built and assembled so that it could be weighted when Bryan turned up. Assembled and weighed the other weapon configurations as the day progressed - the Fixed Spike, AAW, Spiked Scoop, and our main spinning disc - everything came in at pretty much the expected weight, which was good! The evening was spent packing, making last minute preparations, and loading Dave's car and Bryan's 101. Dave and I arrived at about 9.45am, and were barely through the door when we were asked to be ready in 15 minutes! Not a good start, we were expecting to be on in the afternoon (and had people coming to see us fight then), and we were being hassled right from the start. The reasons for the hassle later became clear though - there were very few working robots and so the tech crew were having to hunt around to get fights into the arena. 10/7/02 - Day three of the filming. Our second heat fight was against Thor, and again we used our disc weapon. Their axe hit us a few times, but didn't penetrate our armour, so we rammed them a lot with our disc running, making a mess of their side armour and holing a pneumatic line, so that they lost gas and couldn't retract their axe. Their fur edging managed to clog our disc and broke two of our drive belts, jamming up the disc with one of the broken belts. But we got through, we had done Thor a lot more damage than they did to Tornado! However, closer inspection showed that Tornado had been damaged, and seriously. The front left wheel was rubbing on the chassis - and it became clear that the whole left side of the chassis was bent backwards. We believe the damage was done by the new house robot Growler, as he sped across the arena at one point in the fight and careered into Tornado. Many thanks to Alan Gribble for the help with the chassis repairs and to the Fluffy guys for the big drift! Inshredible were beaten in the other fight of the heat, so our third fight (and last of the heat) was against the very heavily armoured Anarchy, against whom we could do almost nothing! Our only chance was to try and break their side armour - 2 layers of 12mm polycarbonate - so we fitted our fixed spike weapon. The fight proved easier than expected - despite their axe being very powerful, there was a big time delay between us hitting Anarchy's front, and the axe coming down, so I was able to avoid every blow! It didn't help that often Mike (Franklin) hit the flipper button (at the other end of Anarchy) when he meant to hit the axe either... Anarchy got a few flips in and turned us over a few times, but it didn't affect us of course. Despite our intentions, the spike wouldn't do any real damage to Anachy's side armour. 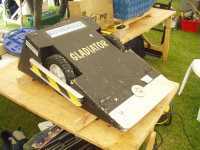 The best damage we did to them was to drive the spike underneath their flipper when it was raised, although even under there Anarchy was well armoured and we did no serious damage. Possibly the heat might have to go out after 9pm however, as this was a bit, er, visual... We won on a judges decision simply by being much more aggressive - this we had won our heat and we were through to the semi finals show! We returned to the accommodation at Nottingham uni in the evening. 11/7/02 - Fourth day of the filming. As we had made it to the semi finals, we moved bench down closer to the arena, to be with the other heat winners. Our first fight of the semis was against the no. 4 seed, Hypno Disc! So we fitted our Anti Spinner Weapon - but the Hypno boys raised an official objection, and we were prevented from using it, as it was viewed according to the rules as a defensive addition rather than an offensive weapon. Of course it was milked for the cameras... Our next best option was to use the charity scoop, which was considered offensive simply because it has two spikes fitted... Our best tactic against Hypno was to stop them getting their disc fully spun up, and so we rammed them head on at the start, and pushed them into everything we could, hitting and stopping the disc with the scoop at every opportunity. It worked well, the scoop took comparatively little damage, and a couple of minutes into the fight, Hypno started making a horrid grinding noise - something in their disc gears was broken, and they were having real trouble spinning up! We won the fight on a judges decision. The Dutch roboteers and robots arrived in the afternoon, and began filling the benches vacated by the defeated UK teams. All the roboteers went to the accomodation at Nottingham uni in the evening. 12/7/02 - Day five of the filming - but a day off for the majority of the crew and the UK roboteers, while the Dutch roboteers assembled and tested their machines. We took the scoop to Dave's parents place in Ilkeston to repair the damage done by Hypno - lots of hammering, grinding and welding. Returned to RAF Newton in the afternoon, and refitted the repaired scoop to Tornado. The Dutch roboteers were busy setting up their machines, quite a few assembling robot kits, but a few had arrived with not even an unfinished machine - they had brought a box of raw materials! Unsurprisingly the tech crew were not impressed - thank goodness for the ringer robots... We spent the evening in the cinema in Nottingham, and then returned to the accommodation at the university. Our second semi final fight (and fifth of the war) was against Dominator 2. Again we used the (freshly repaired) scoop, as we knew that the disc would not touch their Ti armour. We pushed them around a lot, and Dominator 2 managed to get only one glancing blow in. We opened the pit and pushed Dominator 2 towards it, and then towards Matilda, who's CPZ was in the corner closest to the pit. I didn't want Dominator 2 to get out again, so I drove in after them - and straight into Matilda's disc! Tornado took a huge hit in the side of the scoop, and lifted into the air, spinning horizontally as it flew from the CPZ to the other side of the pit. Dominator 2 pulled out of the CPZ backwards, and went straight down the pit... We had won the fight and were now through to the final show - the last four! 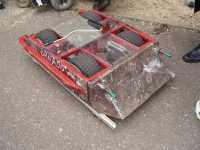 But we had some big damage to fix; although Tornado drove out of the arena, it did so on three wheels - the chassis was seriously twisted! We stripped the chassis down completely in order to repair it. With help from Mike Lambert from Dantomkia, Sam Jones and Chris Organ from Shredder, plus Alan Gribble from Pussycat (acting as welding technician for the event), we managed a bend and cut-n-shut job which brought all four wheels into contact with the ground again. But we ran out of repair time towards the end of the evening, and had to leave much of the work to the next day. Again we were back at the Notts Uni accommodation in the evening - there were very few UK teams there now with so many having been knocked out, and we ourselves weren't expecting to keep coming back! 14/7/02 - Seventh day of filming and Finals day for us. With help from Alan the welding and realigning of the chassis was finished in the morning. We found we had to move the wheel supports backward too, as the cut-n-shut job performed yesterday made it impossible to fit the chains around the wheel sprokets on the impact side. The chassis was reassembled - we found that a lot of the armour would no longer fit, so we had to slot a lot of holes to get it all on. The next problem was the scoop - we were to be fighting Firestorm so we needed to use it, but it would not sit flat on the ground. We had to adjust the tyre pressures to get it close, and then just hope... Firestorm had ground down their front sufficiently that we thought they would get underneath us even with the scoop, so we were very careful that we didn't hit head on at the start... The fight went well, we were on top of Firestorm a couple of times but managed to pull off again before they could put us over the side, they flipped us over once and then back over again, and we both got into a couple of pushing matches - you would expect our 4WD drivetrain to win every time, but the arena was plastered in oil, and Firestorm won a couple of times. We managed to push Firestorm into Shunts CPZ, and Shunt hit them twice, and us once, destroying one of our chain tensioners! We kept going though, and the turning point came when we opened the pit, and managed to push them into it, despite the chain tensioner problem. It seems we were very lucky indeed, becuse Tornado came off stage making a horrid noise, and the chain was off the back sprocket, yet it was still going! So that was it, we had made it through to the Grand Final! The final was to be against the Series 5 champion, Razer! So for the first time on UK TV, we fitted the Anti Crusher Weapon - it was the second time we have used it against Razer (the first being in the TNN Extreme Warriors 2 competition for the USA) and they were prepared with a little lifter attachment for their crushing arm. Many people could not believe what we had built, and even Craig and Philippa came into the pits specially to see the weapon...The fight started OK, the spinning disc giving Razer a few good hits, but after a while the front frame bent and then the disc cut its own belts! So we had to revert to early Tornado tactics and ram... Everything was going Tornado's way, until near the end when Razer's lifter attachment caught hold, and Razer lifted Tornado towards the pit... I kept the throttle hard on forward, just in case Tornado hit the arena floor, and as we came down, Tornado's front wheels caught the edge of the pit, and Tornado surged forward a few inches. Cease was called, but our Anti Crusher Weapon stopped Tornado going into the pit, so the judges had a difficult one to call... It took them about 40 minutes to come to a decision, including re-running the fight over the video monitors for the benefit of everyone, including the audience... 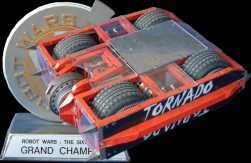 The judges decided that Tornado's wheels had not been fully in the pit, therefore it was not in the pit, and as such we had won! The trophy was given to us by Philippa, and it was very heavy - we nearly dropped it we were so nervous! There were photos in the pits afterwards, and we left everything in the pits for the night, as it was late by now and we were tired. We returned to the accommodation at the university and had a few drinks, but we went to bed pretty early anyhow! 15/7/02 - We returned to the studio after a lie in to pack the robot and say our goodbyes - and collect the trophy! It looks like this has been the best filming so far, not only for reasons obvious but because Mentorn have listened to many of our gripes from previous filmings and tried to do something about them. We've gained a few "new" rules - Interchangeable weapons must be offensive and not purely defensive. Something as simple as a spike makes them offensive... Interchangeable body panels are spares of what is already on the robot, not new or different ones. No modifications, improvements or changes are allowed after tech check, only repairs, unless they are proper interchangeable weapons declared at tech check. 23/7/02 - Team meeting at Dave's house - we discussed what we want to do now that Series 6 is finished, and how much time we want to put into everything. Fortunately it seems we all feel fairly similar about it! Spent the rest of the evening tidying out Dave's garage - managed to make quite a lot of space (mainly by putting loads of stuff in my garage!). 28/7/02 - There are coincidences, and then there are coincidences. My neighbours (who I moved in next door to when I moved to Sawtry earlier this year) saw me in a Team Tornado shirt a while back, and it turns out that Jackie works for Team Tornado - the one that supplies spares for the RAF aircraft! John brought round a Team Tornado mug - thanks Jackie and John! 6/8/02 - Dave and I worked on Tornado - repainting the damage and repairs to the chassis from Series 6, and fitting the best armour in preparation for a photoshoot due to happen later this week. 9/8/02 - Photoshoot in Ipswich, taking shots of the team and the robot. Many thanks to Ed Hoppitt (from the Storm team) for his help with arranging everything and to Cliff Hoppitt for taking the photos. 10/8/02 - Continued the photoshoot in the morning, taking shots of Tornado and our trophies. Returned to Sawtry and spent the afternoon and evening repairing the scoup and repositioning the mounts so it fits the chassis again. Headed off to the Days Inn near Gaydon towards the end of the evening, ready for the Roaming Robots event tomorrow. 11/8/02 - Roaming Robots event at the Heritage Motor Museum, Gaydon. 16/8/02 - Heat F of Series 5 shown on BBC2. Huge Tornado banner in the crowd! 23/8/02 - Heat G of Series 5 on BBC2 - Tornado's heat. We beat Gravedigger (in an extremely oily arena) but then bomb out in the second round to Diotoir! A kart clutch drive sprocket broke, we lost drive on one side and that was that... Our parents and friends appear in the crowd. 25-26/8/02 - Another visit to Ed's in Ipswich. Lots of productive discussions and work with various different speed controllers and motors. 1/9/02 - Dave has tested the nicad Battlepacks borrowed from John Reid. We have the results - they will be posted on the battery page in due course. 12/9/02 - Evening meeting with our sponsor Dave Knight from Knight Battery Sales. 13/9/02 - Our friends Adrian and Nita appear in the crowd in tonights Series 5 show (Heat J). 16/9/02 - Series 6 starts showing on BBC Choice. 19/9/02 - Managed to go and see the bank, everything is sorted now (at least we hope)! 20/9/02 - Call from Neil at Mentorn - we're going to be in the All Stars and either the Commonwealth or European Championships in Extreme 2, due to be filmed from 19th-23rd October. 21/9/02 - Spent the morning working out what bits and pieces we have to sell - have a look at our For Sale page. Got back to working on Tornado, getting it ready for the Extreme 2 filming in a months time. Dismantled the chassis and looked for broken welds, marking and grinding out all we found - there was more than we first thought! Bryan worked on the anti crusher weapon, repairing the damage sustained at Series 6. 27/9/02 - Continued working on the chassis. Found that the grinding and cutting done last weekend had allowed the twist caused during the Dominator II fight in Series 6 to get worse, and it was going to take something special to sort it out. Fortunately Bryan had brought the 101 along for tomorrows Land Rover show, and we made use of its weight along with a few bricks and bits of wood to straighten out the twist in the chassis such that all the wheels will touch the ground again! At one point, we had the full weight of the front of the 101 supported on the chassis - that's got to be nearly 2 tonnes! 28/9/02 - Visit to the Land Rover show - picked up a few tools. 29/9/02 - Dave sorted out the motors, while Bryan sorted out the tyres and ACW, rescuing the disc shaft from the buckled frame. The tyres have been fitted using proper bead sealer now, so they shouldn't go down quite so quickly... Continued on the chassis work, with lots more grinding and welding. The chassis is looking much straighter now, and all the wheels will now touch the ground!